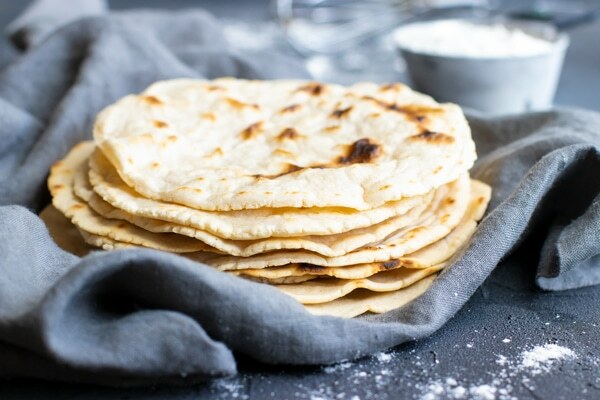 Cassava flour tortillas are super easy to make, only require a few ingredients, and taste as good as a flour tortilla! 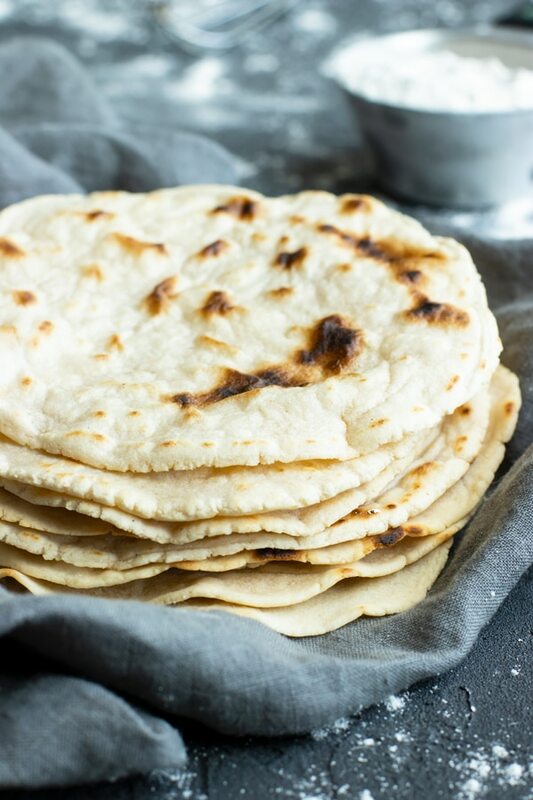 Wrap all of your favorite gluten-free and dairy-free ingredients into these homemade Paleo tortillas for a quick, healthy, vegan, and Whole30 lunch or dinner recipe. Paleo Tortillas That Taste As Good as Flour Tortillas! “Shocked” does not even give our reaction justice. 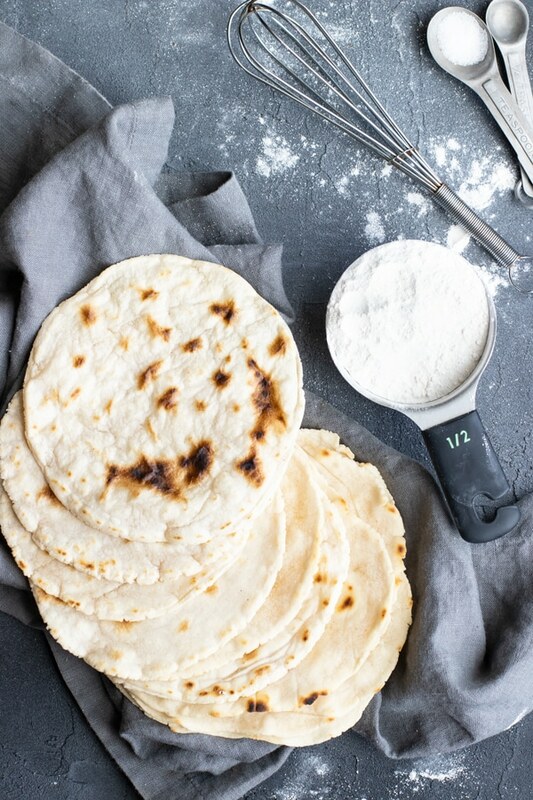 Both Cohl and I sat in utter amazement when we tasted how good cassava flour tortillas actually are and how similar they are to regular flour tortillas. 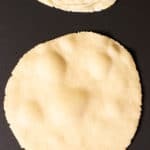 Unlike other grain-free tortillas, this cassava flour tortilla recipe actually held its shape, did not break apart when we rolled up our filling, and had a very similar texture to a flour tortilla. There was no weird aftertaste that you might get from a coconut flour and almond flour tortilla. They’re also totally nut-free and egg-free for anyone that might be allergic! Good ole’ fashioned deliciousness all wrapped up in a delightful cassava flour tortilla. Your Paleo tortilla dreams have come true!! While you are probably already aware that flour tortillas are definitely not Paleo, you might be wondering if corn tortillas are Paleo? Unfortunately, corn is considered a grain that is off-limits with a Paleo diet. So no, corn tortillas are not Paleo. Luckily, though, cassava flour tortillas ARE Paleo! But what is cassava four and how is it Paleo? Cassava flour is made by simply peeling, drying, and then grinding the entire cassava root. Tapioca starch also comes from the cassava root but is made by washing and extracting a starchy liquid instead of using the entire root. 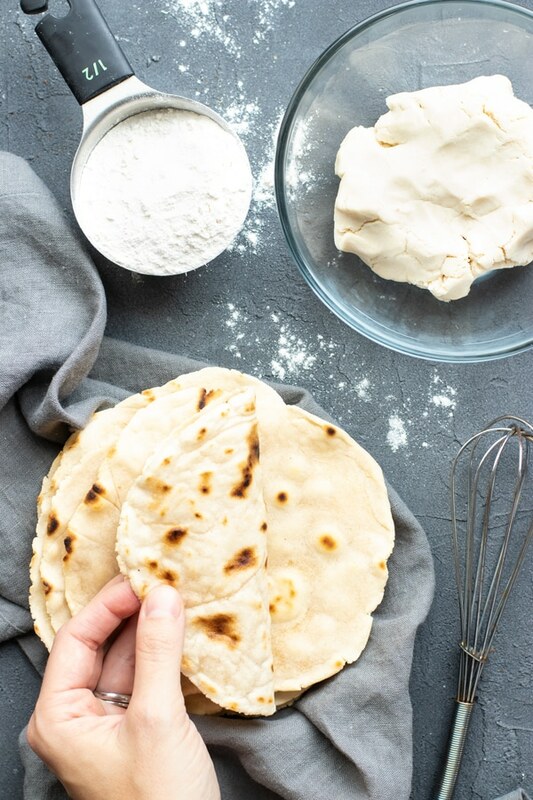 Since cassava flour is full of starchy carbohydrates it makes a great flour to use in gluten-free and Paleo baking as well as when making Paleo tortillas. While cassava flour is not allowed for those on a low-carb or ketogenic diet, it does have some nutritional value in that it is a good source of Vitamin C and manganese. Otto’s Cassava Flour is my favorite and the best to use in these Paleo tortillas! 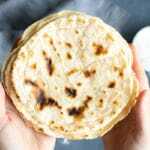 How to Make Cassava Flour Tortillas? Making homemade Paleo tortillas is an easy process that only requires a few ingredients, a skillet or griddle, and a bit of love! Step 1: Whisk together your cassava flour, salt, and garlic powder. The garlic powder is optional, but gives the cassava flour tortillas a great flavor punch! Step 2: Add your oil and water and knead until well combined. Step 3: Roll your dough into balls and then roll out your balls with a rolling pin until 1/8-inch thick and 4-½ to 5 inches in diameter. You can also shape your Paleo tortillas by using a tortilla press. Step 4: Heat a DRY skillet (yes, dry!) or electric griddle over medium-high heat and cook your tortillas for 1-2 minutes per side. You’ll know when to flip them when they start bubbling up! Step 5: Serve your tortillas warm with yummy filling ingredients. Whip up these Easy Skillet Sweet Potatoes and add a fried egg and guacamole. Cook up these Ground Turkey Tacos with a Paleo taco seasoning and serve with Paleo tortillas instead of corn. Make these Sheet Pan Chicken Fajitas for a good Tex-Mex Paleo taco. Go Paleo AND vegan by filling up your cassava flour tortillas with a simple sweet potato and brussels sprouts combo. 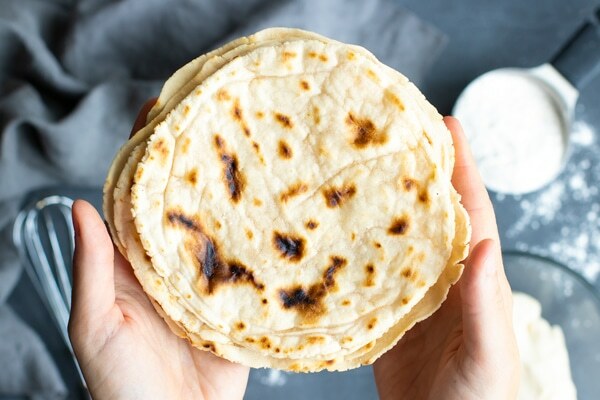 Cassava flour tortillas are super easy to make, only require a few ingredients, and taste as good as a flour tortilla! In a large bowl whisk together cassava flour, salt, and garlic powder. Add oil and warm water. Knead dough until thoroughly mixed. Divide dough into 8 equal portions. Roll each portion into a ball and place between two pieces of parchment paper. Using a rolling pin, roll dough until it is ⅛-inch thick and has a diameter of 4 ½-5 inches. Or, place balls of dough into a tortilla press. Repeat with remaining balls of dough. Heat a dry skillet or griddle over medium-high heat. Cook each tortilla for 1-2 minutes per side, or until it begins to bubble. Serve tortillas warm with your favorite taco ingredients and enjoy! *4 Weight Watchers points per tortilla. Want more recipes like these Paleo Cassava Flour Tortillas? These look just like real tortillas! Cannot wait to try them. They taste like them too!! Thanks so much for your comment and rating! Is this based on 1 cup cassava flour = 140g? Hi Theresa! Yes, it will be one level cup (not packed) and should weigh 140 grams. The dough will be affected by humidity as well as other factors, so the best way to tell if you have the correct ratios is for the dough to easily come together (and not keep breaking apart!) while also not sticking to your hands. Thanks for your question! We used Anthony’s flour and they turned out really good. We did have to add more water than the recipe. Yay, Brian!! So happy you enjoyed them. Yes, the water can vary depending on numerous factors (Cassava flour brand, humidity, etc.) Thanks for your comment and rating!! Can you freeze these? I’m a busy working mom and so I like to make large batches of food and freeze it for later use. Hi Terri! Unfortunately, these tortillas do not do super well when refrigerated and I would assume it’s the same when frozen. (They get a little hard and are difficult to reheat after a few days.) If you need quick cassava flour tortillas check out the Siete brand at your grocery store. Their cassava and almond flour tortillas are awesome! My dough did not look like yours. It was very wet, I followed the recipe. Is there any recommendations? Hi Keren! It completely depends on the type of Cassava flour you use. Different flours can give you either a super dry or super moist dough. I used Otto’s Cassava flour in this particular recipe! These came out perfectly and my husband and I were blown away on how EASY they are to make and how DELICIOUS they taste! Thank you so much!